Yesterday was a day I’d been dreading for a long, long time. The few days leading up to the exam were terrible for me. I don’t think I have ever been as stressed as I was then – and I can get pretty stressed! I started not being able to sleep more than 10 minutes at a time and on the night before the exam, I was only able to stay in bed for 2 hours. Laying down and closing my eyes was torture because it gave my brain the chance to play out every worst-case scenario. When the day arrived, I was absolutely miserable. I believed whole-heartedly that it was going to go badly and was dreading having to go to the exam to confirm that fear. With such little sleep and so many stress hormones flowing through me, I was a shivering mess come exam time. When the examiner came to collect us, I noticed that my legs felt like spaghetti. I was so nervous and sleep deprived for this exam that I literally could not think straight. I was boiling inside my suit and could not stop shaking. When he asked me to show him the topics I’d chosen, I was shaking so badly that he couldn’t read them off the card. I apologized and he smiled and said, “It’s okay. It’s nice.”. I wonder if by “nice” he meant endearing? It was such a horrible feeling because I know that, in exams, half of it is how you present yourself and your knowledge – and I wasn’t doing a very good job. For these I made drawings of the nerves leaving the brainstem and then added in which muscles they innervated at the end branches. He ended up asking me some questions from material covered in previous semesters – and let’s just say I wasn’t prepared for that! My mental block was completely solid at this point. It was like I knew nothing other than what I had been able to write down on the page. So when he asked me questions like, “what are the infrahyoid muscles?” and “what are the muscles of the larynx?”, I was caught completely off-guard. Luckily it didn’t count against me. I think it was more of his way of giving me an idea of what it could be like in the final exam at the end of the year. 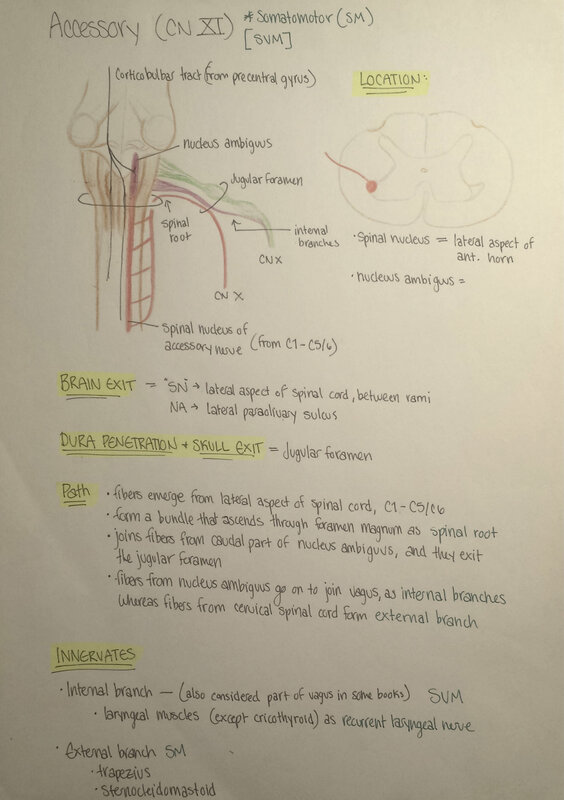 I started out doing a drawing of the dorsal brain stem, but couldn’t think clearly enough and couldn’t remember what I was doing, so I found it easier to just list them out. I say “easier”, but it was so, so hard. I was under so much self-inflicted pressure and was really struggling to organize my thoughts. I think I spent 45 minutes just trying to put it all together. The worst part about this topic is that we covered it in the middle of the semester – so I should have known it well from before. I’d left topics I’d covered well during the semester until the end of my exam prep, not considering that I would probably be too stressed to absorb the information properly. Anyways, I was able to get it all down in the end. Since I had already done the 11th and 12th cranial nerves in my first topic, I was able to leave those two out. The examiner wanted to just look at the list, saying that it was such a big topic and would take too much time to explain. By this point, any brain power I had was completely drained, so when the follow-up questions came, my delivery was lacking. Luckily, he could see my answers and knew that I knew it. After my shaking episode in the beginning, I’m sure he knew my mental state. What are the GVM (general visceromotor) nuclei? Where are they located in the brainstem? What is another name for these types of nuclei? What group of nuclei are in the ventromedial part of the brainstem? And the ventrolateral? Which nuclei are included there? 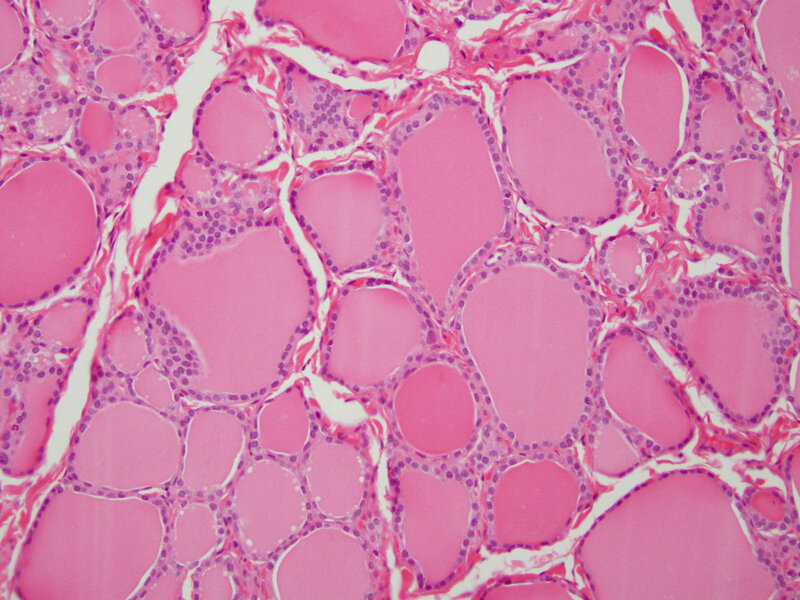 Which nuclei provides parasympathetic fibers to the facial nerve? Where is it located? Which are the cochlear nuclei? Where are they located? Where is the nucleus ambiguus located? 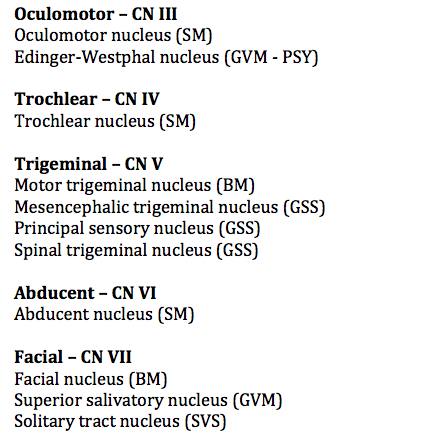 Which cranial nerves does it lend fibers to? What type is the solitary tract nucleus? Where is it located? Which cranial nerves does it lend fibers to? What is its upper part? Which nuclei does it lend fibers to? 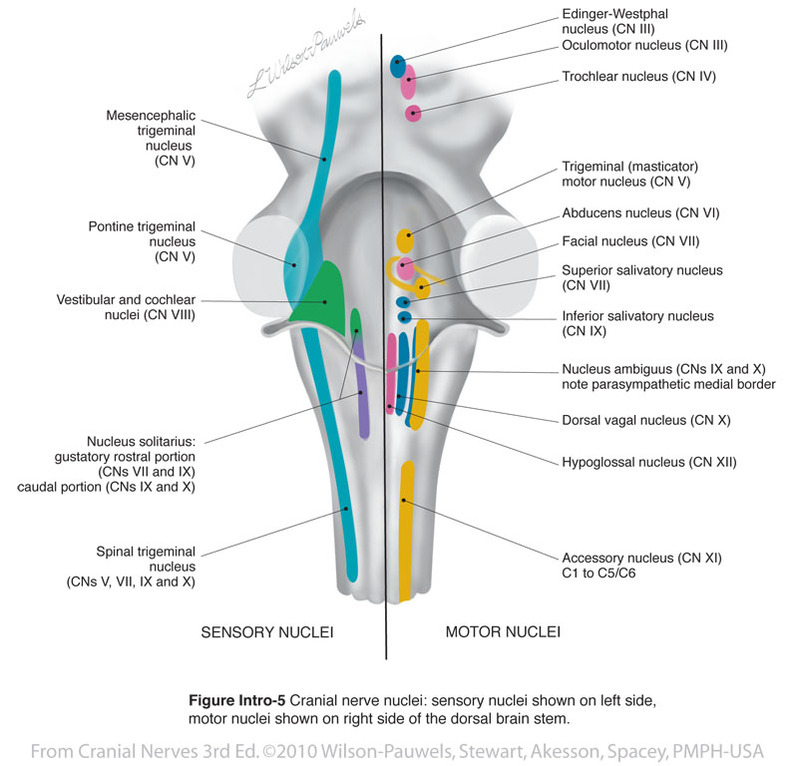 Where is the spinal trigeminal nucleus? 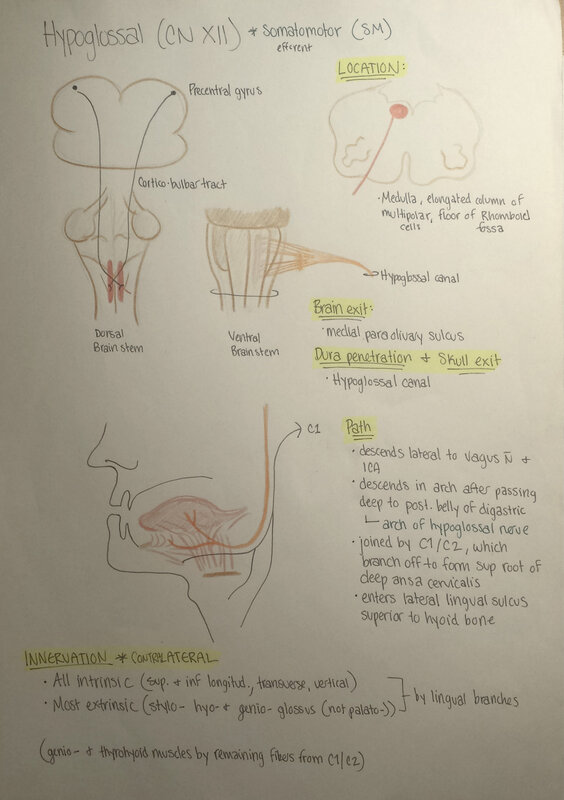 Where are the superior and inferior salivatory nuclei? I love this slide, so I was so happy that I got it. It’s an easy one, yes, but it is also beautiful. I love the perfectly homogenous colloid sections in the slide. I mentioned that the colloid was thyroglobulin, a precursor for T3 and T4, which is secreted by the surrounding follicular cells. I then mentioned that there were parafollicular cells that secreted calcitonin. It’s funny because, while reviewing the slide, I’d thought to myself, “this is anatomy, so they probably won’t ask me what calcitonin does because that is more of a physiology question”. Even so, I decided to look it up, just in case. And guess what? He asked me! Unfortunately, I didn’t quite remember. I knew it had something to do with the level of calcium in the blood, but answered incorrectly about whether or not it was increased or decreased by calcitonin (it’s decreased). He also asked me the full name of T3 and T4 (silly me for only remembering the abbreviation). I could only manage “thyro…..” and he had to fill in “…oxine. Thyroxine.”. To finish off, he asked me a little about the gland: where it is located, what its structure is like (e.g. how many lobes), etc. Out of all the topics this one could have been, I ended up with something completely unexpected. The original topic I got was: organ and pathway of taste. But then he changed it. 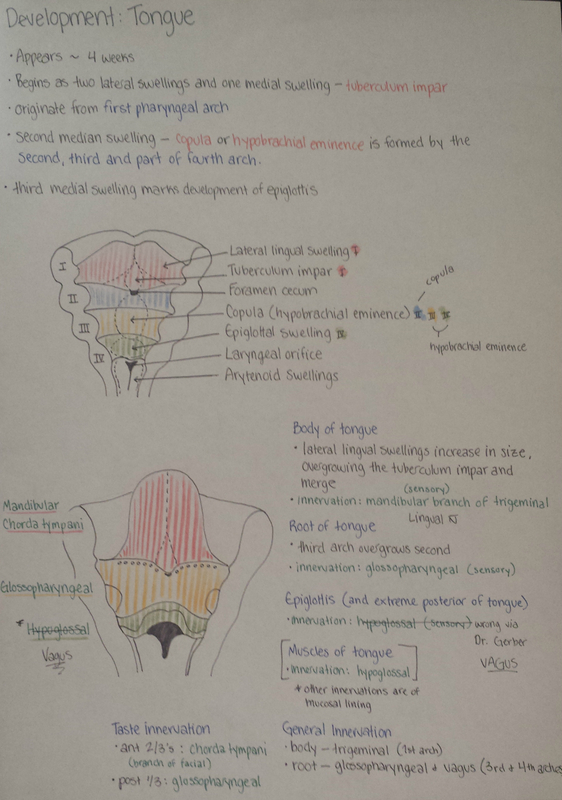 He said that he didn’t want the pathway and that I should present the development (embryology) of the tongue. Since it didn’t say “development” in the topic on the topic list, I didn’t think we needed to cover that for this semester’s exam. We had to know the development of the endocrine organs, central nervous system (brain and spinal cord), the peripheral nervous system, the eye, the ear and the components of hearing. The taste and smell sensory topics were only two topics (one each) on the topic list, versus the eye and ear which each had 11 topics. So, I had to pull up knowledge from last semester – again! Luckily, this was a topic that I had really enjoyed and understood. I was able to almost perfectly recreate the drawing I have in my second semester notes – thank goodness! Since then I have been: sleeping! I took a 3 hour nap when I got home and slept another 11 hours last night. I’m giving myself today off because I really, truly need it. Then from tomorrow, it’s biochemistry cram time! It’s my last exam and the “easiest” of the three we have this exam period. Finally, there is light at the end of the tunnel! § 4 Responses to Anatomy III: Check! We live in some strange world where we consider this biochem to be “easiest”. Hope it’s going well! Haha, I know! I never imagined that I would say that. It’s going ok…my head is so foggy! I feel like my capacity for memorizing large amounts of information is decreasing… Hope it’s better on your end! You are currently reading Anatomy III: Check! at Buda-B.